Spray 5- to 6-quart slow cooker with cooking spray. Place turkey in cooker. Brush with honey mustard. Sprinkle with rosemary, thyme, basil, garlic pepper and salt. Pour broth around turkey. To thaw the turkey completely before cooking, place it in the refrigerator for about 48 hours. Or place the tightly wrapped turkey breast in cold water, replacing the water often so it stays cold; allow about 30 minutes per pound (2 to 2 1/2 hours). Complete this harvest feast with baked acorn squash halves, a green salad tossed with dried cranberries and poppy seed dressing and whole wheat rolls. 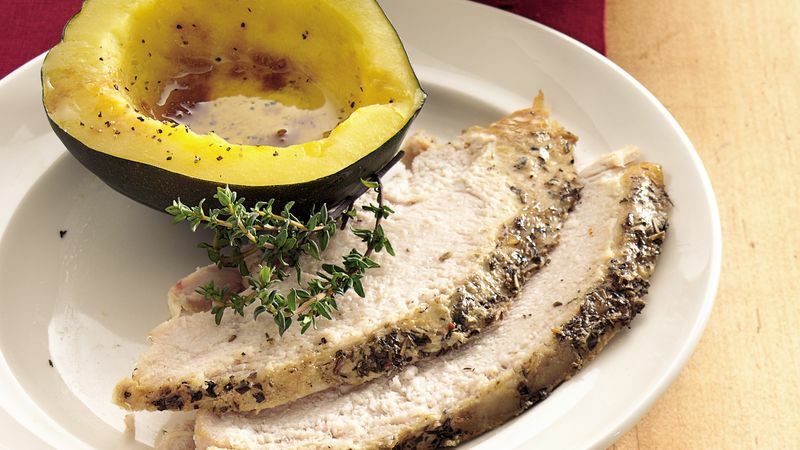 Use this savory turkey in casseroles, soups and salads. Or slice it for moist, flavorful turkey sandwiches. Wrap the breast tightly and store in the fridge for up to 3 days.